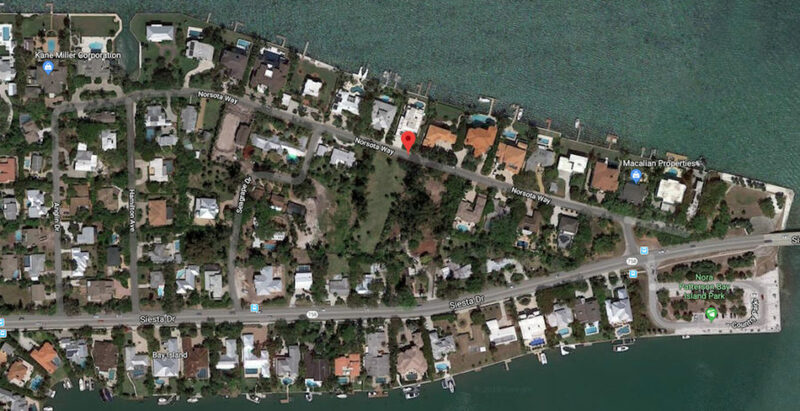 The Siesta Key Association is not the only organization pushing for enforcement of the county’s regulation prohibiting short-term property rentals in Residential Single Family (RSF) housing districts on the Key. The letter continued, “This neighborhood was once filled by families, retirees, and young, working people. Some were paying mortgages and others paid rent, but everyone took pride in this community. Our neighborhood is now pocked by houses that change renters every week or more frequently. … Strangers wandering our streets, Cars overflowing driveways, garbage set out days ahead of pick up, and noise at all hours. These short-term landlords have stolen our community, degraded our lifestyle, and lowered our property values. Up to now, they have taken advantage of our good natures and the lack of zoning enforcement. But now, it is going to stop,” the letter said. 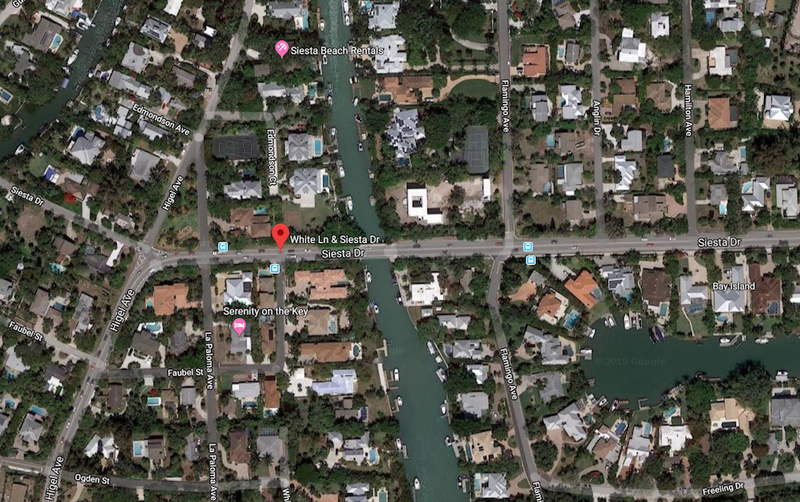 In a single-family housing district on Siesta Key, no property may be rented more than once very 30 days, the Sarasota County Code says. Her address is on Calle de Peru, according to the card she filled out to address the board. “My house was in very bad shape when I bought it,” Kim told the board, adding that her renovation of it was expensive. “It’s now a cute little Siesta Key Cottage,” she said. “It’s not a big house,” she continued, even though, she noted, the trend on Siesta is for bigger homes. The owner of the only big house on her street has told her that her house is an eyesore, Kim added. “These people who call themselves good neighbors are not really good neighbors,” she said, referring again to the letter. When Chair Nancy Detert asked Kim whether she had brought the letter with her to the meeting, Kim said she had. Detert asked her to give it to the clerk to the board. “We’re probably interested in trying to help you and look at where that came from,” Detert added. “That would be really great,” Kim responded. The SarasotaNews Leadercontacted Joe Volpe, the Siesta Key Association (SKA) director who has been the point person for that nonprofit in regard to concerns about illegal short-tem rentals on the island. He was not familiar with the group named in the letter, he said, but he planned to contact it. The letter did include an email address and a post office box number in Sarasota. The next speaker during the Sept. 12 Open to the Public period was Chad Waites, a Siesta property owner who said he is an Airbnb host. (He also addressed the board on Aug. 22.) Waites provided statistics about how much Tourist Development Tax — or “bed tax” — revenue the county has received from Airbnb, the online accommodations company. Based on 2016 bookings, Waites pointed out, the county would have collected $355,000 in Tourist Development Tax revenue as a result of Airbnb rentals. In May 2017, Waites continued, the County Commission and Airbnb finally reached an agreement on the organization’s payment of the 5% county bed tax from its hosts’ accommodations in the county. Yet, the county’s rental rules will continue to force families, especially, to seek out other areas to stay when they do start returning to the county, he said. The three primary complaints he has heard about short-term rentals, Waites continued, pertain to garbage cans put out too far in advance of the weekly collections and then remaining for days at the curbside after Waste Management makes its rounds; too much noise from guests; and too many vehicles parked at rental properties. Yet, he added, he has neighbors who are full-time residents and are guilty of such violations. Licensing of short-term rental businesses, with a mandatory registration requirement. Means of resolving complaints and an enforcement procedure for violations of code of conduct regulations. Mandatory inspections and the naming of a local contact for emergency purposes. “All I’m asking is to sit down and talk about this,” Waites added. Commissioner Alan Maio — who represents District 4, which includes Siesta — told Waites he had received the email Waites had sent him and had spoken the previous day on the phone with a person calling on Waites’ behalf. “I think I referred you to Matt Osterhoudt,” Maio added. Osterhoudt is director of the county’s Planning and Development Services Department, which includes the Code Enforcement Division. “I never heard back,” Waites told Maio. “Matt’ll get a hold of you,” Maio replied. 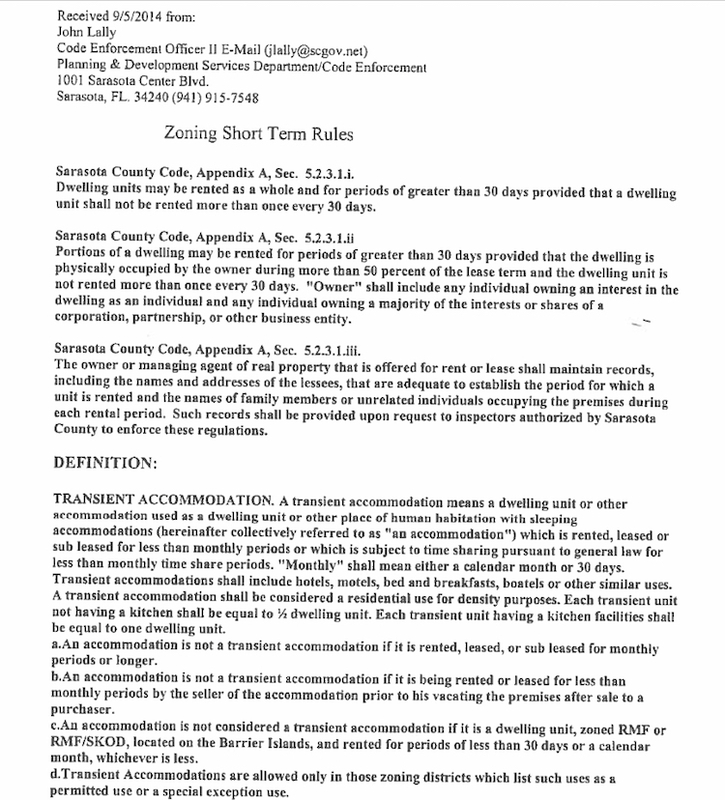 Different rules apply to the county’s barrier islands than to the mainland, Maio continued, and different rules apply to single-family housing districts, compared to those for multi-family home districts. 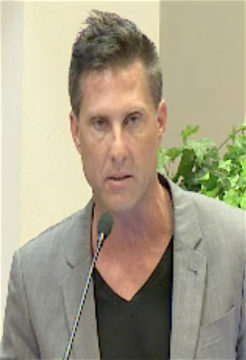 Waites also told the board that he had asked staff why the county has such strict rules regarding short-term rentals on Siesta Key. The answer he received, he said, was because the island has so many full-time residents. However, that no longer is the situation on the Key, Waites maintained. He asked staff for data to support its assertion, he added, and he was told the data dated to 1996 and no longer was available for review. “We’ll take care of it,” Chair Detert responded. Maio reiterated that staff would provide Waites with a copy of the county regulations regarding rental properties. Then Detert announced that the next speaker must be Waites’ wife: Patricia Waites. Patricia Waites read a poem she had written about the short-term rental issue, supporting her son. One other person who addressed the board that evening on the issue was Lisa McBride, a Realtor with Keller Williams on the Water in Sarasota. She said the property rights of all homeowners should be protected. Everyone in the area depends on tourism “to keep our economy thriving,” she added. “We support our community on tax dollars,” she continued, noting that she believes investor homeownership often is ignored. They also want to “generate a little bit of income to offset the cost of home ownership,” she noted. 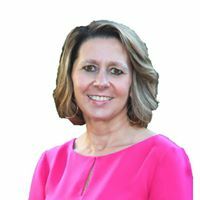 She had talked to a number of local real estate agents, she added, who have experienced such situations with prospective buyers. 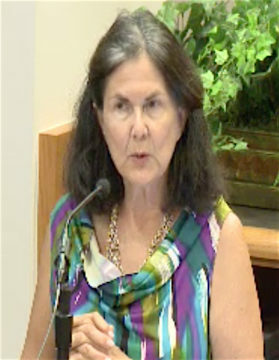 McBride told the commissioners she believes a compromise is needed. During the Sept. 6 SKA meeting, Sgt. Jason Mruczek of the Sarasota County Sheriff’s Office piqued audience members’ interest with his report of an early-morning incident in August on Higel Avenue, which resulted in several arrests. On Aug. 9, two 16-year-old males were charged with Attempted Burglary of an Occupied Structure, while a 19-year-old woman was charged with Accessory after the Fact, according to reports that Kaitlyn Perez, community affairs director for the Sheriff’s Office, provided the News Leader. Just after 6 a.m. on Aug. 9, the owner of a home in the 5000 block of Higel Avenue called the Sheriff’s Office to after she saw two males in her carport, allegedly trying to break into her vehicle, one of the responding officers wrote. The woman yelled at them, “and they fled on foot toward the road,” the report said. They climbed into a white sedan, “which drove away at a high rate of speed,” the report noted. Patrol units in the area were able to locate the vehicle, the report continued. When they attempted to stop it, however, it sped away, but it eventually crashed into the wall at the intersection of Siesta Drive and White Lane. By the time the officers reached the scene, the report said, the suspects had fled. With the help of a K9 unit, deputies located all three suspects walking in the vicinity of Siesta Drive and Gulfmead Drive, the reports noted. Sylvester Lee Sanders Jr., 16, of 1837 22ndSt., Sarasota, and Tydarius G. Washington, 16, of 1150 Polk St., Fort Myers, both were charged with Attempted Burglary of an Occupied Structure. Takia C. Turner, 19, of 3259 Natures Circle, Unit 106, in Sarasota, was charted with Accessory After the Fact for driving the getaway vehicle, one report said. That is a second-degree felony. 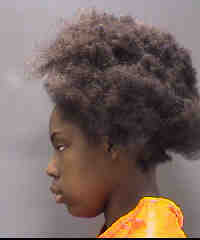 She was released under $1,500 bond, according to Sarasota County jail records. Because Sylvester and Tydarius are juveniles, no arrest records were available for them. Deputies later learned that a warrant had been issued for Tydarius because he had failed to appear in court on a matter in Fort Myers, his report pointed out. Later, when officers contacted the owner of the vehicle used in the Higel incident, one report added, the owner told them it had been stolen from her driveway overnight on Aug. 8. It took several months for investigators with the Sarasota Police Department to conclude their work on the June 14 Siesta Drive incident that resulted in part of the road being shut down for several hours during the morning commute, Genevieve Judge, the public information officer for the department, told the News Leader. The driver of the vehicle, Tyler Leonard, 27, of Windsong Lane, was traveling eastbound at a high rate of speed when he ran off the road and struck a concrete Florida Power & Light Co. pole, the report added. The pole “was broken near the top, the report noted. The collusion caused the vehicle to spin counterclockwise, the report added. The passenger side crashed through a fence and slid across a small tree before coming to rest in the front yard of the house at 830 Siesta Drive. Leonard “had severe injuries,” the report pointed out. When an officer spoke with him at Sarasota Memorial Hospital, the report added, Leonard indicated that he had no memory of the crash. He had had to be extricated from the vehicle, the report said.